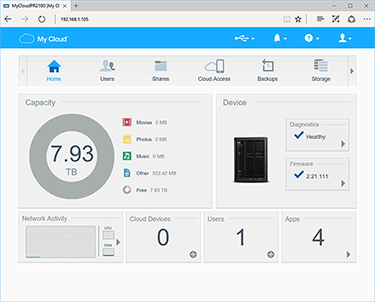 WD is building on the success of its My Cloud storage servers with the introduction of two new models launched under the Pro Series umbrella. 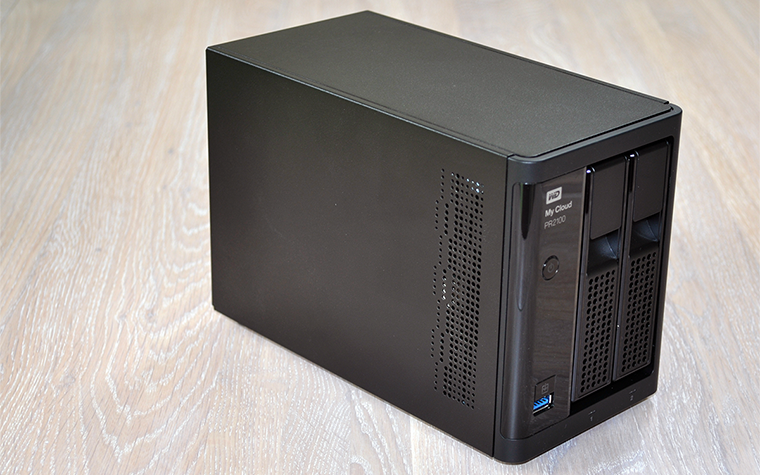 Dubbed the PR2100 and PR4100, the latest My Cloud units offer two-bay and four-bay storage priced from £380 and £450, respectively, and we have the former in for review today. Described by the manufacturer as a "powerful collaboration hub for your entire team," the PR2100 has its sights set on creative professionals seeking high capacity, fast access and sufficient underlying power for on-the-fly hardware transcoding and streaming of popular formats such as 4K video. Brand recognition and availability in high-street stores has aided WD's progress in the NAS marketplace, and the PR2100 looks set to strengthen the My Cloud appeal. Compact dimensions of 192mm (H) x 232mm (D) x 170mm (W) make it a tidy-looking box that would sit neatly in a home or office environment, and for those seeking an off-the-shelf solution that's ready to go, pre-populated models are available in 4TB (£580), 8TB (£660), 12TB (£760) and 16TB (£860) capacities. 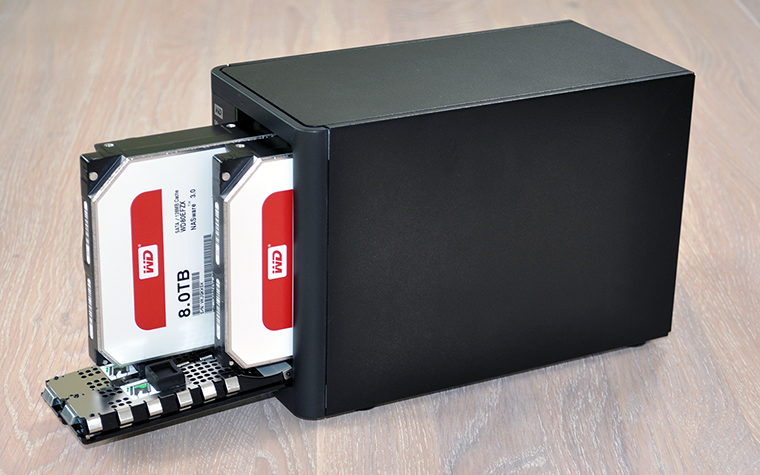 Our 16TB review sample is home to dual WD Red 8TB hard disks in a RAID 1 array, resulting in 8TB of usable space and the peace of mind that comes with a mirrored backup. 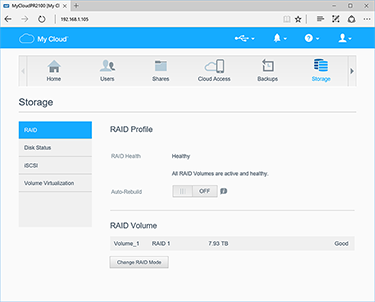 A pre-configured RAID volume is helpful, yet there's another incentive in buying a pre-populated model as the all the units are backed by a three-year warranty, compared to standard two-year cover for the diskless box. Levered doors at the front of the unit reveal access to the tool-less, tray-less bays, and though neither door is lockable, the latch mechanism feels suitably robust and drives slide-in smoothly. Keeping things simple, the only front-facing port is a USB 3.0 connector and it's joined by two buttons - one-touch copy, for quickly transferring the contents of a USB-attached device, and a backlit power button that shines blue when everything is in order, and red when the NAS needs attention. 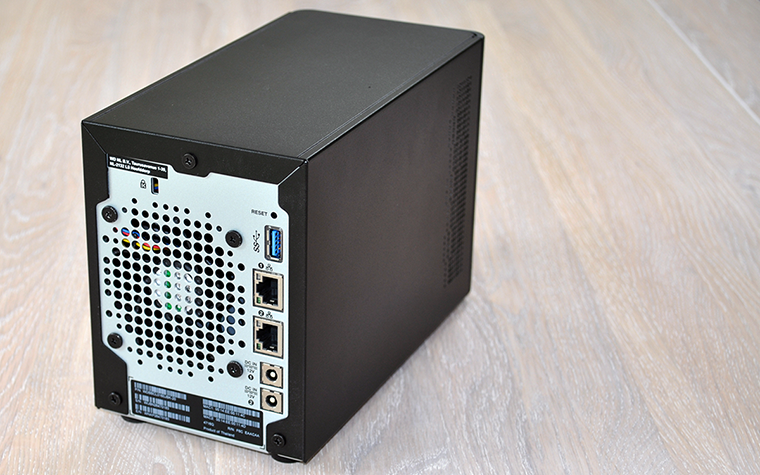 The bulk of the Pro Series PR2100's connectivity options take place around back, where you'll find a cooling fan sat alongside a second USB 3.0 port, dual Gigabit Ethernet and two power connectors supporting auto failover. A customary Kensington lock is also included, as is a single Ethernet cable and a small external power supply, while the user manual is available as a PDF download. With creative professionals and prosumers in mind, WD has stepped away from the ARM-based SoCs that featured prominently in earlier My Cloud units and opts instead for a quad-core Intel Pentium N3710 processor capable of speeds of up to 2.56GHz. The 6W chip is joined by 4GB of DDR3 memory, and though the core components are identical to the four-bay PR4100, it's worth noting that the PR2100 does miss out on expandable memory and an integrated LCD display. 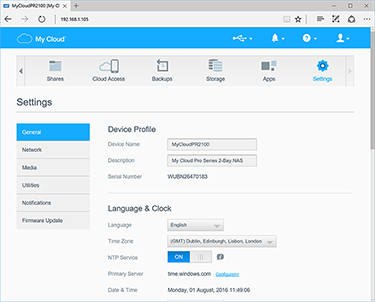 The Pro Series can be deemed accessible to those with little networking experience as WD ensures that both the hardware and software are easy to get to grips with. Initial setup is as simple as attaching the power adapter, connecting the box to your network, pressing the power button and pointing the web browser on any networked PC to mycloud.com/setup. 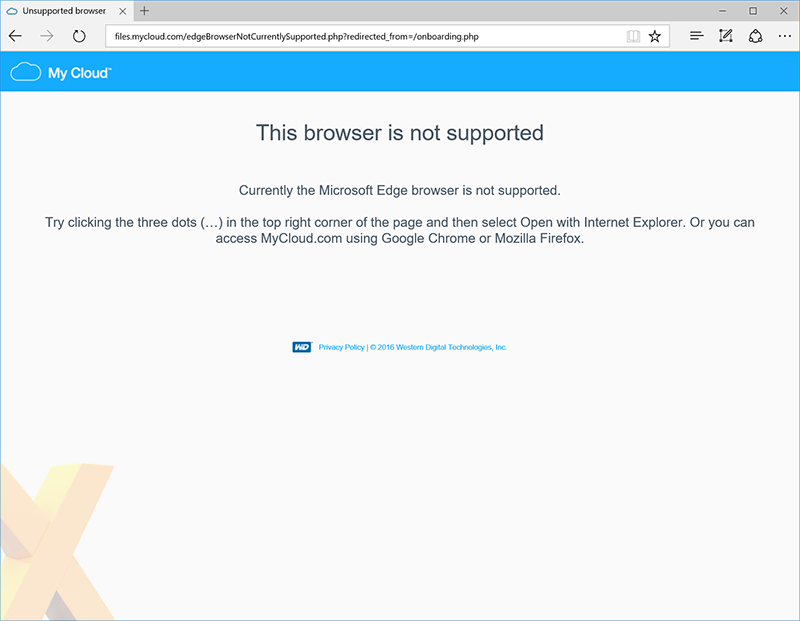 The web-based GUI should automatically detect the NAS and begin the setup wizard, though WD has missed a trick in not ensuring compatibility with Windows 10's default browser, Microsoft Edge. Once setup is complete, users are dropped into a familiar-looking My Cloud home screen. WD's clean presentation is both efficient to get around and easy on the eye, with all available functions split into a series of sections arranged in a horizontal menu bar. The interface and indeed feature set can be considered lightweight compared to rival offerings from the likes of Qnap and Synology, yet this could be a blessing in disguise - the My Cloud OS might be missing exotic extras such as virtualisation or SSD caching, but focussing on the essentials has enabled a more streamlined interface. The majority of PR2100's controls and options are laid out logically, and My Cloud's feature set includes support for multiple users or groups, comprehensive PC and Mac backups to USB, remote or cloud, a choice of JBOD, RAID 0 or RAID 1 storage configurations, as well as built-in media, iTunes, FTP, and download servers. 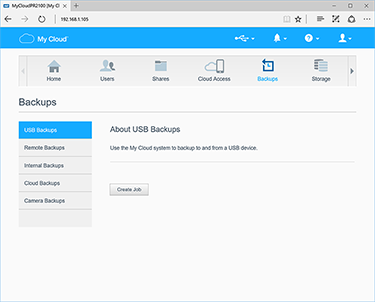 Accompanying My Cloud mobile apps and the MyCloud.com website provide remote access over the Internet, while the PR2100's integrated app depository has been expanded to include the likes of Dropbox, WordPress and the popular Plex Media Server. 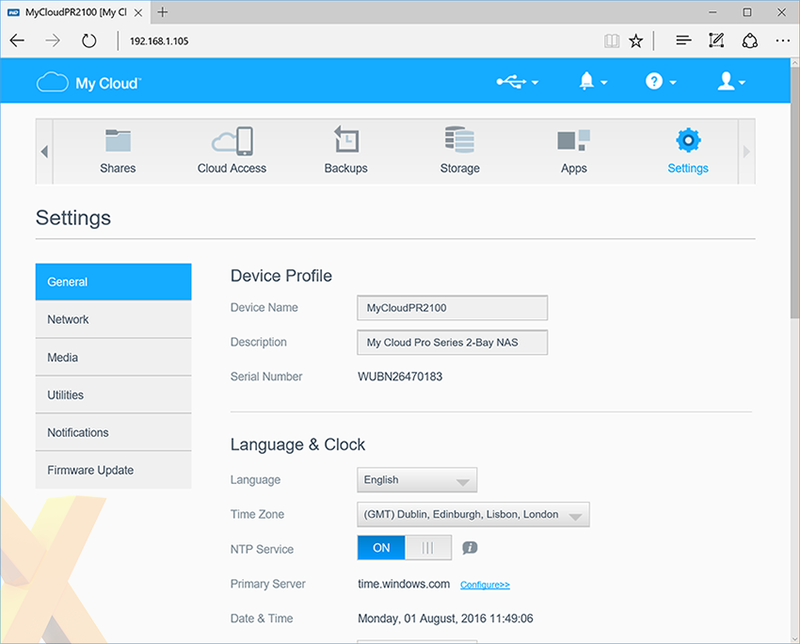 An option for surveillance cameras is also available via a tie-in with Milestone Arcus, and as a further nod toward the target audience, WD is keen to point out that the latest release of its My Cloud mobile app now offers integration with Adobe's Creative Cloud.